In essence just mix all of the above into a large mixing bowl! 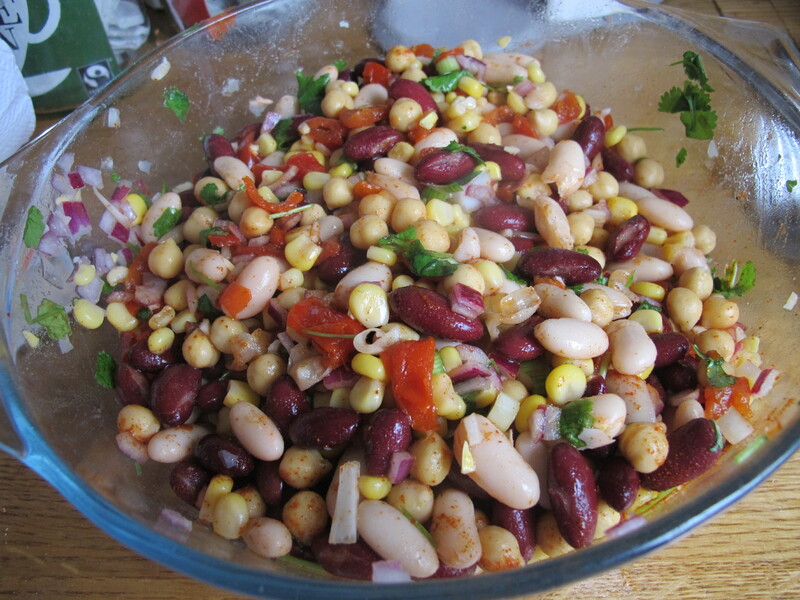 In terms of the olive oil, just add a good swish to the bean/sweetcorn/pepper/herb mix to coat. Don’t drown in oil of course otherwise it won’t end up being very healthy but just add a swish of oil then the white wine vinegar and lime juice and taste and adjust to your liking. I added paprika but you don’t “have” to. I used 2 garlic cloves so as not to offend anyone I might see that day with my garlic breath but you can add more of course. Once you are happy with your bean mix refrigerate for a few hours before serving to allow the beans to soak up the flavour of the dressing. My other half couldn’t wait for a few hours so we did have a serving straightaway and it tasted very nice- if you have time to refrigerate it just adds to the flavour. This amount (using 3 tins of beans) does last for a few lunches so if you don’t want to be eating beans for days then you could halve the amount of beans used. We loved this so much though that we were happy to have it for a few days in a row. Mmmm, sounds really nice and nutritious. will certainly try this, thanks! Going to try this on Sunday, a Church Lunch for 40 people!! Not everyone will want it, so going to treble the quantities. I love this. Never thought of putting bell pepper in it though. I will next time, for added crunch! Thanks for your lovely comment, that’s great to hear!! So pleased you like them- got lots more vegetarian recipes I’ve tried recently that I’m just waiting to find enough time to sit down and post them! Found your recipe just before Christmas and now my new fave summer dish. Thanks for sharing from New Zealand. I’ve made this twice now. Fabulously easy and yummy :) Thanks for sharing! Previous Post What’s your vice?